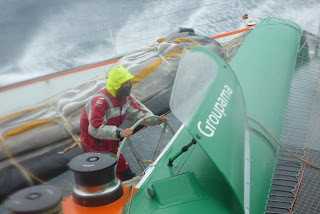 The weather situation is changing at the entrance to the Indian Ocean: Groupama 3 is right in the thick of it now and will have to compromise with a strong N'ly wind blowing down off Africa. Conditions are harsh but this shouldn't continue for long and the trajectory towards Tasmania is likely to be very straight and fast. "On Sunday there were a pile of birds around... Then this morning a huge albatross followed us from daybreak. At noon today we're in a transition zone between the front which was following us and the N'ly air flow, which is due to hit us with 40 knots late this afternoon. We even had a moment of sunshine and it's not too cold: we've had time to have a little break! I haven't even put my boots on yet..." indicated Steve Ravussin at the 1130 UTC radio link-up. Heavy airs jib and reefs Groupama 3 had to reposition herself slightly to the South just before crossing the longitude of Cape Agulhas, in order to avoid a zone of confluence where the breeze was light. 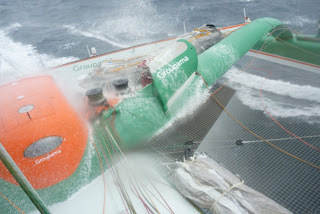 However this zigzag hasn't proved disadvantageous, quite the contrary in fact, as Franck Cammas and his nine crew are just 200 miles behind Orange 2. 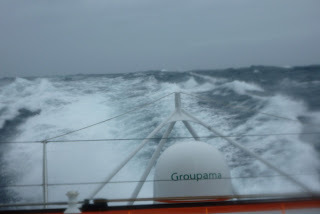 In addition, the reigning Jules Verne Trophy holder didn't enjoy great conditions in her crossing of the Indian Ocean so, if all goes to plan, the giant trimaran should have made up her deficit a good way before the Kerguelen Islands. By sailing along the southern edge of a zone of high pressure, the boat shouldn't suffer too much as the seas won't have had time to build. "We're going to be beam on in this harsh wind and we've prepared the heavy airs jib and intend to put in reefs. This gale will last for around twenty hours. It's not going to be very pleasant, but we're lucky that we'll be sailing in following seas. It's set to be a bit different than it was two years ago! We've performed a general check-up and all's well. We'll be ready to tackle these conditions before nightfall... We're trying to sail without putting too much strain on the foils, especially the starboard one, which has been working hard since the start. 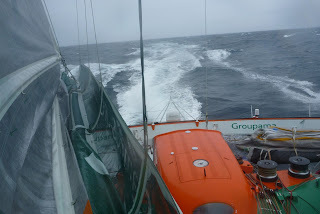 As such we're rarely exceeding 37 knots, but we do at times make 42 knots as we did yesterday."